How come... Fox are commenting on "what if Moore wins" when their OWN POLL yesterday has Jones winning in a landslide? IF it was a GENUINE poll... they would surely be all in discussing the FACT that Jones was going to win? Fox have Karl Rove and Chris Stirewalt doing election analysis... TWO BEAUTIES!! Hahaha. 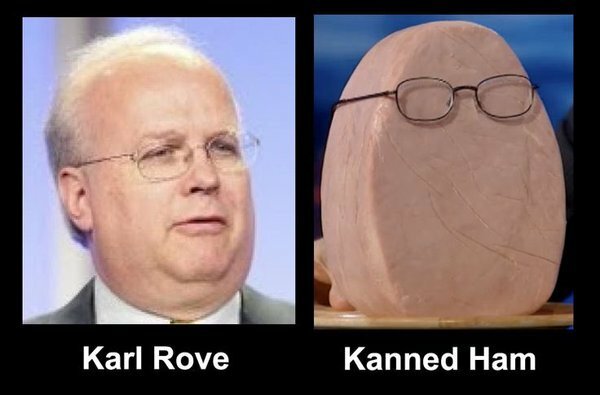 I love that meme of Rove. It's spot on. I will weigh in. I think it will be Moore - double digits. Maybe only 10 due to the bullschitt. But double digit none theless. The problem will be Birmingham and Huntsville. But the abortion stand of Jones will do him in with Alabamians, including African American Democrats so they will stay home. I have been listening to the ongoing "Moral equivalence" across all accusations... and people still dont GET (or pretend to not get) that there is a huge difference when accusations are 40 years old!!! And... the "accusations" amount to dating mostly.... the 14 year old is FAR from credible... and the Allred thing is a FAKE. Look it. I worked in middle management for a major corporation. SOME women, I believe, in the work force have experienced some degree of harassment at some point. It is all on the individual how you handle it. HR is usually NOT the way to handle it, they are ONLY looking out for the corporation. So be a woman, put a stop to it. Do not put yourself in bad situations. I do not consider compliments HARASSMENT. I do not consider racy jokes to NECESSARILY be harassment. In my opinion a lot of times the woman sets the tone for how her male co workers treat her. If you cannot handle the situation, FIND ANOTHER JOB. If you can't let it go, hire an attorney immediately, not a quarter of a century late. You do not wait 10, 20 or 40 years. If you come out IMMEDIATELY, I may be inclined to believe you. Good grief. What a load of BS. I feel sorry for the people that believe this garbage. If you waited it out over 40 years, IT DID NOT HAVE ANY AFFECT ON YOU, you made it, you got over it and moved on. Yeah it might have been an uncomfortable period of time in your life. Big deal, LIFE ISN'T ALWAYS FAIR. Last edited by Showpoodles on Tue Dec 12, 2017 9:18 pm, edited 1 time in total. Yeah, these 20-somethings on twitter just now voting and calling Moore a child-molester have no idea about real life. Wait until they grow up, as things get harder and then they can scream life isn't fair. All this time waiting (all day) is giving me anxiety, lol. I can't imagine those close to the election. Just tell me WHEN Moore wins. Jones shows a lead.... but.... DONT PANIC!! Ughhh I forgot about Mobile. 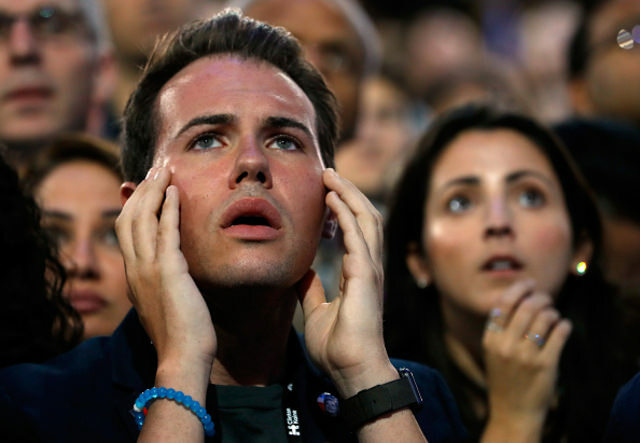 The only worry I really have was possible cheating in the early votes. Oh my, kanned ham!!! I love it. Hate the guy though!! 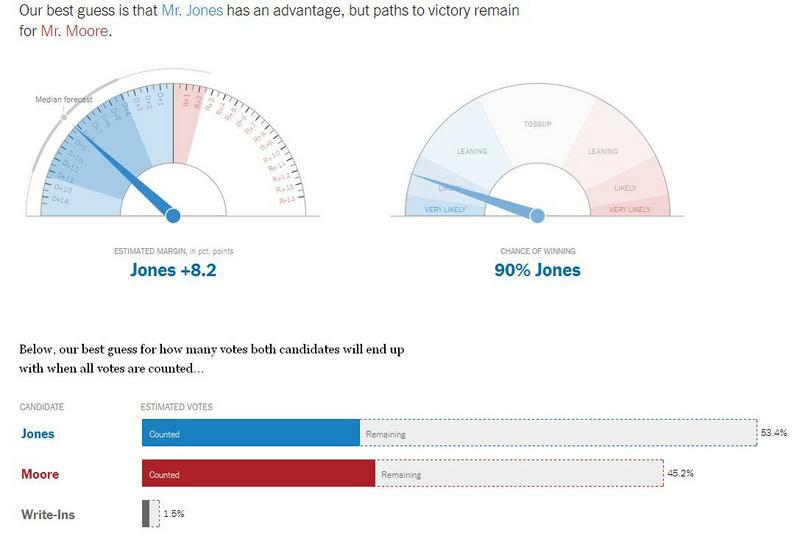 Sweet home, Alabama where the skies are so blue"
I UNDERSTAND why the Failing NY times and other liberal Media are PREDICTING a Jones win (74% chance Jones wins).... but the numbers alone do not support that???? It's harder to understand WHY Hannity and his guests are going along with that? Already talking as if Moore has lost?? I could not have been more wrong in what i thought was going to happen. What is happening to Alabama? Did they hold the Jones friendly (more than friendly) urban areas to the end so they would know what they needed for him to win? Well, all I can say is I wanted Alabama to do what President Trump asked, Luther Strange. Although I did not really like him either. I was not a Moore fan but definitely wanted him over Jones. What a nightmare. Meh. We still have President Trump so hopefully all still works out. Rumpole, I believe you just hit the nail on the head! No puns intended.